I’m not that new to Lush, I always buy a bath bomb before we take a trip somewhere with a soaking tub. BUT, I never really bought into the hype about most of the skin products. That is, until recently. I had the world’s worst break out around Christmas. It had been brewing for awhile, but it really went psycho. I don’t know if it was the stress of all the things going on around the holidays, my hormones playing mean tricks, or what, but a few things that found their way under the tree from Lush made a huge difference. Herbalism Cleanser: I have dry skin, so I try to avoid using anything abrasive… but the almonds in this don’t seem to irritate my skin. I wash my face once a day at night (you know, to remove makeup and all that fun stuff) and alternate this every other day with a gentle cream cleanser. Keeps the dry skin flakies at bay, and keeps my face nice a clear. Tea Tree Toner Water: I use this as a preventative on areas where I tend to break out the most (especially around the jawline and lower cheek areas.) I find it’s not as hydrating as the rest of my face needs, so I use a moisturizing toner elsewhere. I’ve heard that when you run out, you can mix the Tea Tree Toner Tabs with water and refill the bottle for much, much less and for the same benefits. Grease Lightning Cleanser: This is supposed to be a cleanser, but I actually use it as a spot treatment. I really like it because it doesn’t make my skin peel and flake like Salicylic Acid or Benzoyl Peroxide does. It seems to flatten blemishes and dry them up within a day or two, depending on the severity. Ro’s Argan Body Conditioner: Obsessed. This is a little splurgey for something I use in the shower, but I will definitely be buying this again. It smells so good (from what I understand it is the same scent as Rose Jam body wash, which I will also be picking up soon!) and it allows me to skip moisturizing post shower. My normally itchy dry winter skin is so much better this year, and I’m thinking it’s all due to this product. If you’re new to Lush, I’m not the only blogger who’s obsessed. 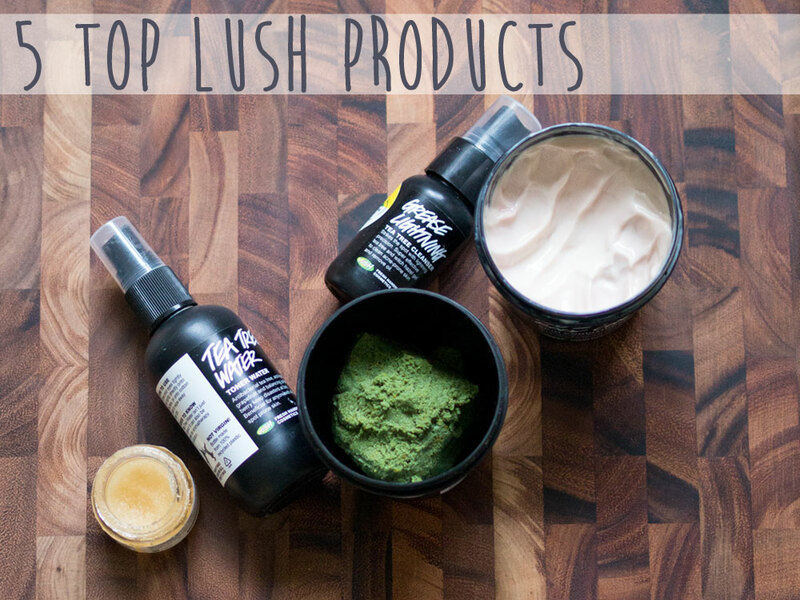 Check out Cat’s post on her favorite Lush masks or Kelly’s post on her beauty favorites. I definitely have a few of their picks on my list for next time! And for all of you Valentine’s Lovers (or haters, I won’t judge) I have a fun little giveaway to show my love for all of you. D’awwww. Get yourself entered below, this giveaway will be running for a week in hopes that it will make it to you before the 14th so you can treat yourself. If you’re an international reader, I’ll have to make it a PayPal payment so you can treat yourself in some other way. Good luck! Are you a Lush fan? What other products do I need to try? TRUE ROMANCE gift set is my favorite from LUSH. Ooh, I’ll have to check that one out! Good luck, Mai! I love Lush’s soaps, they smell just wonderful and really moisturize. They do smell great! Thanks for entering, Sharon! Hello! As I’m single, I’m not doing anything for Valentine’s Day. It’s fine though. I’ll probably go out to eat with my best friend. Thank-you for this super fun chance! That sounds like fun! Good luck, Natalie! Sounds like a fun way to celebrate! Thanks for entering, Keru! Jarrod and I are going out to dinner at a fancy place, we might see a movie too or get ice cream after, I’m not sure yet. Sounds like a fun night! Thanks for entering, Breenah! Ha, sounds like a good way to celebrate! And haha, which kind of soap is it? I have no idea honestly. it’s like soupy + I have literally had it since I graduated college, I just move it with my bathroom stuff from place to place! I love Lush and I use just about all of the products you listed. Herbalism is amazing as well as the Tea Tree Toner. I also love the face mask in Cupcake. It does wonders for my acne prone skin! thanks for the giveaway! we are going to a byob mexican place that i have a groupon for. i’m excited to try it. enjoy yours! I think we’re staying in for a Game Night, and cooking up a romantic meal! Lunch and a matinee movie with some girlfriends!! Sounds like fun! Thanks for entering, Heather! The only thing I’ve ever gotten to try from Lush were the bath bombs and they smelled AMAZING! They’re bath bombs do smell good! I wish I had more of a reason to use them more often! We’re doing an at home date night this year for Valentine’s Day. My husband is an incredible cook so he is going to make something for us and we’ll enjoy a bottle of our favorite champagne, Veuve Clicquot. It’s going to be a nice, quiet night. We both have a crazy week at work leading up to Valentine’s Day and decided that sounded nicer than fighting a crowd at a restaurant. I got the popcorn lip scrub for my birthday….sooo amazing, and you need to try the Ocean Salt Scrub. I highly recommend that! I want to try the popcorn lip scrub! For Valentine’s Day we will probably go out to dinner! Sounds like fun, and thanks for entering Julia! I’ll be getting dressed up and going for dinner with my Husband. Sounds like fun! Thanks for entering! Oh that sounds fun! Thanks for entering, Shelley! I do not have plans for Valentine’s Day yet. I also have not tried Lush yet. Me and the hubby are staying in on V-day. I will make him his favorite meal (mac and cheese) and we will probably watch a movie. Nice and simple. Oh that sounds like fun. Mac and Cheese is my favorite too! Good luck, Tania! I don’t have any vday plans yet. I don’t have any plans for Valentine’s Day yet. I will probably do something low-key! Sounds like what we’ll do too. Thanks for entering, Meegan! Oh that sounds like fun! Thanks for entering, Brooklyn! I keep hearing about Lush but haven’t tried them yet. I will have to, now! The bath bombs look amazing-maybe I will treat myself to one on my wedding anniversary trip next month! And this giveaway is the bomb! That sounds like a fabulous idea! So glad you like the giveaway, and thanks for entering, Chelsie! I’m also surprised you loved the tea tree toner that much. I’ve tried a fair amount of Lush products, but really felt like that didn’t do too much for my skin that I could tell. I totally agree with you on the popcorn lip scrub, though. Obsessed! This one might not be as good for your skin of you’re prone to drying, but I love Fresh Farmacy for battling my acne. It’s seriously the best daily cleanser I’ve ever tried. See, I’m not 100% sure that it’s that particular product, but I find when I don’t use it I do have break outs, but it could be a coincidence as well. That’s the tricky thing about acne-prone skin since there are so many variables! I will have to try Fresh Farmacy, but maybe in the summer when I’m less dry. I’ve heard good things about it! I definitely need to try some of their facial masks! I love this tequila scrub (I think it was tequila) followed by a lemon lotion. Maybe the Ocean Sea Salt (it’s vodka-based)? I’ll have to check out the lemon lotion too! Thanks for entering, Emily! I have been ogling Lush products for years, but sadly I’ve never pulled the trigger on anything. I’ve wanted to try their Big Shampoo for a while, but that popcorn lip scrub sounds amazing too! I’ve heard tons of great things about the Big Shampoo, and of course I highly recommend the lip scrub! Ha, no worries! You’ll have to let me know if you try the toner! I’ve never actually bought anything from Lush. I always walk past the shops, having a good look in, but I never properly look around, because they’re always so busy. I think next time, I’ll have to make an effort and fight my way through the crowds. They are always busy, aren’t they?! It definitely can be overwhelming, but they always have the most helpful employees if you have any questions, and they’re not as hard-sell as some shops! For Valentines Day I am going home (I am away at school,) for dinner with my boyfriend! Aw, hope you have fun and safe travels! Thanks for entering, Paige! I love spending the evening with my hubby! Good to hear that you like the Herbalism – I might have to give it another try! I got some for my birthday last year and used it all up. I liked it but didn’t find it did anything special for my skin. At the same time, i was having one of my worst ever eczema episodes and my skin was pretty gnarly in general, so probably not the best time to be evaluating products! Oh no! You’re probably right, but I do find that I can’t use it everyday since it does seem to be made more for oily skin than dry/sensitive like mine. I do like that it makes my skin feel soft and gets rid of the flaky bits though! I love Lush too! We actually have some of the same favorites. If I had to pick one, I think it would be Herbalism. I did a blog post on my favorites here: http://atinycupofcake.com/lush-skincare-review/ — fun to see some similar items! My boyfriend and I already had an early Valentine’s Day- we went out for a really nice dinner and saw a broadway play afterwards! We had an amazing time. Aw, sounds like a good time! Thanks for entering, Mika! I cooking herb marinated rack of lamb for my hubby and he is bringing home a movie for us to watch! Oh yum! Sounds like it will be a great night! Thanks for entering, Laura! I like the face masks! The Lush bath bombs are my faves!!! I love ’em too! Thanks for entering, Kim! I will be working on v day :( oh well we don’t really celebrate anyway. Oh no, bummer! Thanks for entering, Tara! Aw, bummer! Hope you’re able to get a little R&R! Thanks for entering, Paige! The fiance and I (that will never get old to say!) are going out for dinner and dancing, so I couldn’t be more excited! I’m 100% cheesy and hopelessly romantic around Valentine’s Day, so bring on the pink and the hearts and chocolate and flowers! Aww, sounds like a fun night! :) Thanks for entering, Erica! My Valentine’s Day is going to be an early dinner followed by a comedy show and concert. Oh that sounds like a great way to spend the night! Thanks for entering, Krystal! Great list of products! I love Lush. But love to try other products too. I’m single so I’m going to take my mom out for dinner. Aw, how sweet of you! Hope you have fun, and thanks for entering, Destiny! I do not have any plans for valentines day as of now. I do not have a favorite Lush product because I’ve not used any but I am wanting to try the Big Shampoo. I’ve heard wonderful things about Lush. Thanks so much for this opportunity. I’ve heard a lot of good things about Big Shampoo too! Thanks for entering, Christy! My husband and I were talking about maybe going out of town the weekend of Valentine’s Day to somewhere where we could stay in a cabin. Aw, sweet! Thanks for entering, Samantha! This will be the first Valentine’s day since my divorce but I’m spending it will an old flame to see if we can rekindle the fire that we once had. It’s been 10 years and we both realized that no matter what life threw at us we never forgot about each other :)! We are planning on going out to a nice dinner and then maybe a movie. Aw, I hope things work out! Thanks for entering, Stephanie! Probably just a nice dinner at home!! The hubby and I love to cook together! Sounds fun! Thanks for entering, Erin! I am so in love with lush! Ocean salt and rub rub rub are some of my favorites! Thanks for the suggestions – will definitely have to try those! Thanks for entering, Haley! The toner you have is great- also love the lush face masks, especially the blueberry catastrophe cosmetic! I have that one on my list, I’m definitely going to have to try it soon! Thanks for entering, Karen! Awww, sounds like a good way to celebrate. Thanks for entering, Shane! I’ll have to check that one out! Thanks for entering, Lubka! That’s one of mine as well. Thanks for entering, Karin! A Lush recently opened in my town…my girlfriends and I were so excited. I love their bath bombs, I haven’t figured out which one is my favorite. Oh fun, glad you have one nearby now! Thanks for entering, Jennifer! I’m taking my girl dancing. My husband’s and I are going to Carrabba’s restaurant. Sounds delicious! Thanks for entering, Connie! I’m not doing anything for Valentine’s Day – but the day before (Galentine’s Day), I’m having a little get-together with my sisters. Oh that sounds fun! Thanks for entering, Rebecca! I love the mask of magnanimity, and when that runs out, I’m getting the lettuce mask. I’m going to have to grab a face mask to try next time i visit Lush! Thanks for entering. Patricia! We will be having a dinner at home that I will prepare and will probably watch a movie after the meal. Sounds like a great night! Good luck, Suzanne! I am going to go the store and grab a couple of steaks and enjoy an evening at home with my hubby. Sounds great. Thanks for entering, Virginia!